In today’s article I’m going to show you the most common mistake people make when setting a New Year’s Resolution. The thing that surprises me the most is that my clients already know how to achieve the New Year’s Resolutions they set without me even having to teach them anything. How do I know this, well let me give you an example. Have you booked your holiday yet for summer? I can guarantee that as soon as December is over all you will see on the TV is advert after advert showing us all the cheap holiday deals abroad. Of course this is because at the beginning of the year we all start to think about what we’re going to do this year for our summer holiday. If you are like me you will go online, explore various hotels and different websites until you find the one that suits you the best and then immediately get out your credit card and pay a deposit. Once that deposit has been paid something inside just takes over. From there you will create a list of everything you’re going to need for your newly booked holiday. What clothes am I going to need? Do I need to purchase any new clothes (of course I will)? How many shorts, t-shirts, socks, underwear, shoes and towels am I going to need? What gadgets am I going to be taking with me and do I need extra insurance for them? That reminds me, I need travel insurance, passport and other travel documents. Am I driving to the airport and leaving my car or will I book a taxi? How will I get to my hotel when I’ve landed? How much money am I going to need? The list goes on and on but I hope you can see the point I’m trying to make here. We all want a summer holiday and we will (unknowingly) create a detailed action plan on exactly how we’re going to make it happen. 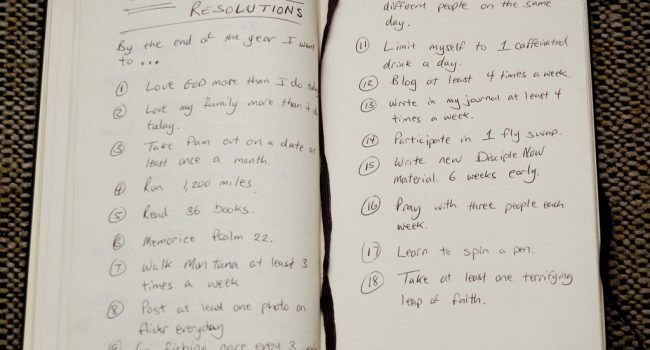 You need to do exactly the same for your New Year’s Resolutions! In fact, you need to do more than plan, you need to be able to visualise your life once your New Year’s Resolution has been achieved. Just like when booking a holiday you can already see yourself on the beach, enjoying a drink or two, going for a swim in the pool, going out for a nice meal on an evening and finally at night when it’s lights out – swatting them damn mozzies! So how do you go about setting a good New Year’s Resolution? How many should you set? How do you prioritise them? Well let me show you what I do when I’m setting a New Year’s Resolution. The first step is to make some sort of commitment. I’m sure you notice a shift in your attitude as soon as you make that initial deposit for your holiday. You now know there is no going back (at least without consequences). The urgency to get things done increases and you go into auto-pilot to make sure you are going to have everything you need to make your summer holiday happen. Once you are committed, which is the hardest hurdle to overcome by the way, you can then focus on how to plan for the outcome you want as well as create that important vision in your mind which is going to give you the drive and determination to achieve exactly what it is you want. This is where my Single Page Plan goal setting system can help. In fact, not only will it show you how to set a good New Year’s Resolution for the year, it will get you to visualise the future you want to be living and provide you with other life goals that you probably hadn’t even thought of. So what do you need to do to get started with the Single Page Plan? Well first of all it’s free to create your plan. Simply create a free account and from there I have provided you with a complete video training series where I take you through each step of the Single Page Plan process. Once your plan is created, using your life vision as a guide, you will then work out your action plan for the next year. After that then it’s up to you. You can either go it alone and work at your own pace OR you can make that financial commitment and choose one of the many support options available for the Single Page Plan system to encourage you to stay focused, stay positive and stay accountable for your actions throughout this next year. After all they start from only £9.95 per month. Just remember, like booking that Summer Holiday, planning is the key to achieving a New Year’s Resolution and failing to plan is the most common mistake I see people make when setting any goal or New Year’s Resolution. Don’t make the same mistake this year! No matter what method of planning you choose to try and achieve your New Year’s Resolution, whether it be through my Single Page Plan goal setting system or maybe just a simple checklist, I wish you the best of luck in achieving it. Self-help as well as professional help is always available for you here at singlepageplan.com when you need it. In the meantime have a great Christmas and start dreaming of your perfect year! I am a life coach, blogger, speaker and author who loves helping others discover the unlimited possibilities and opportunities awaiting them, enabling them to overcome their difficulties and get their life back on track. Welcome to the Goal Setting Made Easy with The Single Page Plan blog. You will find a wide range of goal setting tips, tricks and techniques to ensure you stay on track with achieving your goals! Are you ready to create your dream life? Get more productive – Is this the best use of my time right now?